Perch fishing in Old Kenosha (Published by Our Wisconsin Magazine; Aug/Sep 2017) - The Works of Joe Campolo Jr.
My Dad after rolling his jeep in Europe during WWII. His favorite activity was perch fishing. 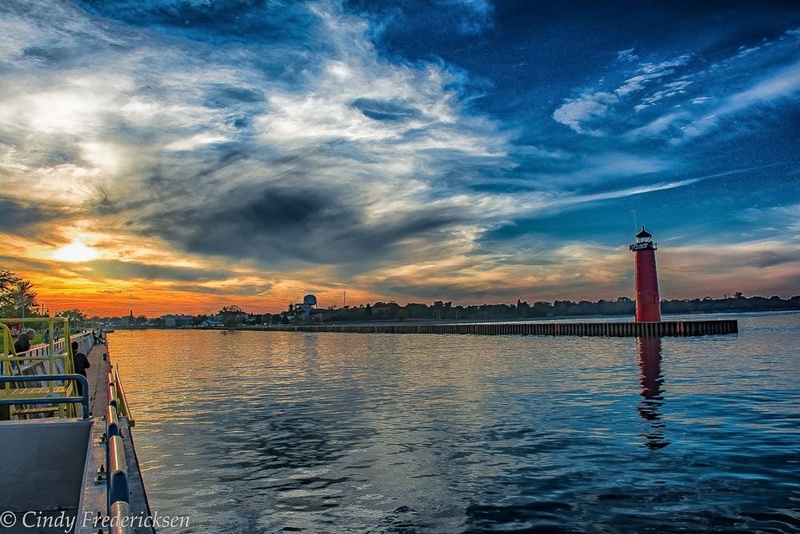 Growing up in Kenosha, Wisconsin along the shores of Lake Michigan provided many adventures in swimming and fishing for those of us that lived there. 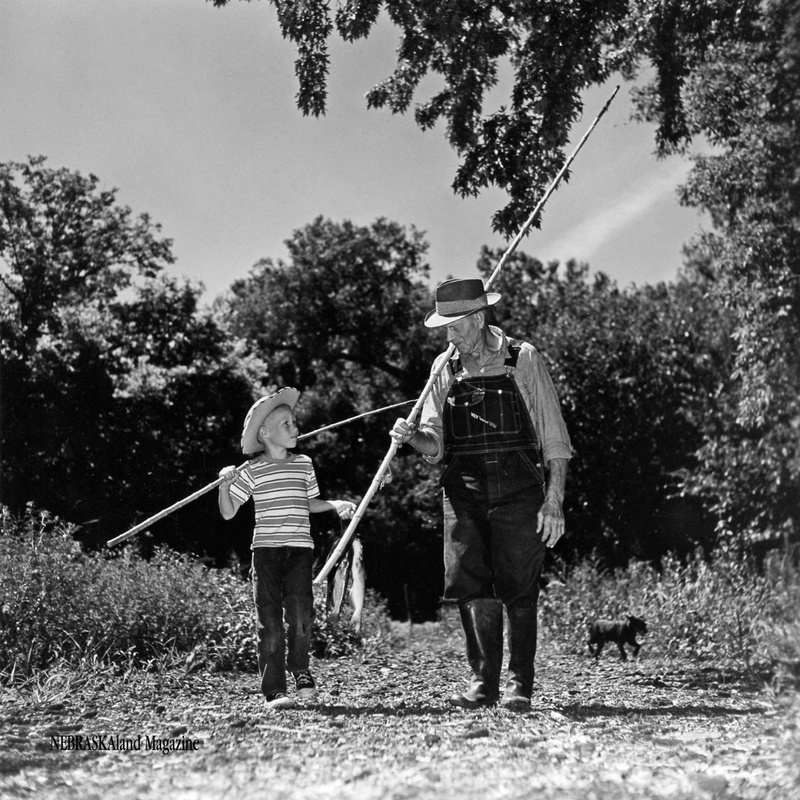 For any kid raised back in the day, Lake Michigan perch fishing was always a favorite activity, both spring and summer. Before salmon and trout fishing took hold, the lake perch was king in the big lake. Many of us would scramble down to its cold shores early in the morning in hopes of catching a batch of the tasty little critters. I, like many of my peers at that time, had a morning paper route from Henoch News Agency so I had to finish delivering the papers before doing anything else. But once done, the side baskets of my bike which had just been full of newspapers now contained my fishing gear; and along with my brother and/or friends off we went. 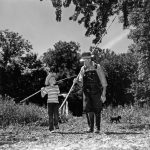 Our dads had introduced us to perch fishing at an early age and many of them would head down on weekends, or mornings when they didn’t have to work. When Dad went along we rode in the car in style! First thing we did was hit the bait shop to pick up a couple dozen “shiners”. The little minnows were usually all that was needed to catch a nice fat perch. But the real die hard perchers preferred crayfish tails, commonly referred to as crab tails, or just crawdads. Crabs as they were called could be caught at night at the Lincoln Lagoon or Pikes Creek, among other places. All one needed was a flashlight and a willingness to get wet feet. This activity itself could turn into an adventure. The critters would be hiding under submerged rocks and logs in shallow water. Just flip the rock over and grab the wily crayfish before it scooted away. Once in a while a crayfish would be found inside an old can it crawled in and couldn’t get out of as a result of its own growth. Meat from the crab tails would often catch the biggest perch, and the guys having crab meat for bait were high on the pecking order of fishermen at the lakefront. A routine stop at the bait shop landed me in hot water with my dad for a whole summer one year. Back in those days most everyone fished with bamboo cane poles. Nothing fancy, some had one extension, some two, and some even three; in order to get them out over the water farther. The line was wrapped around the end section of the pole for travel and storage. Some fisherman had little wooden boards which they sat on that had holders for two cane poles. Those guys were taken seriously. My dad had two, three section cane poles and the “serious” seat with the holders. Some of the old timers had bait casting reels sitting at home, and a few of the young “whippersnappers” had some of the new spin cast reels that Zebco pushed out faster than Ford dealers pumped out Falcons; but serious perchers disdained the “fancy” gear, brushing it off with a frown… “You don’t need dat”! 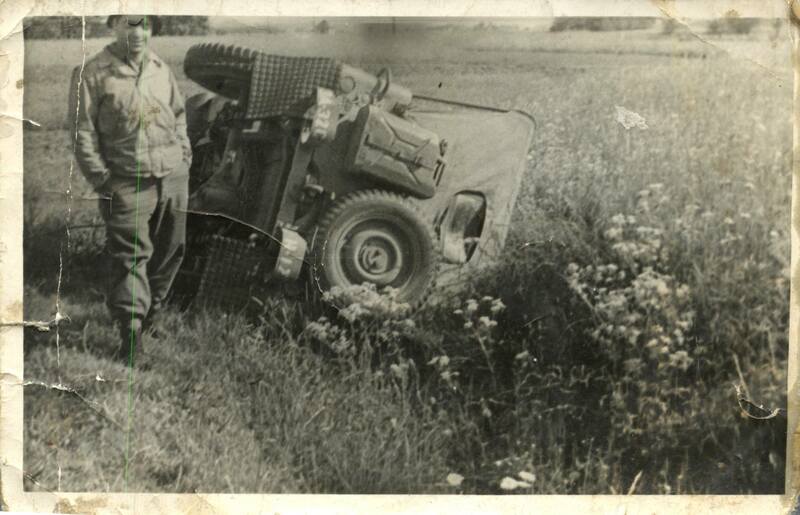 On one particular fishing excursion it was my job to load the car with the cane poles and tackle. I carelessly slipped the poles through the open back window paying no heed to where they landed. A section of the poles remained sticking out the window, but of course I was clueless to the impending disaster. Sure enough, when we pulled in front of the bait shop, the pole sticking out the farthest hit a small road sign next to the curb, and with a loud crack it snapped like a twig run over by a garbage truck. The sharp report of fracturing bamboo got everyone’s attention including my dad who, immediately assessing the damage was now looking at me red with rage. (My dad had that look pretty much nailed) I knew I was in trouble; of course it was his favorite pole. Luckily I was out of his reach in the backseat behind him, as he flailed away with his right hand. Back then parents were still allowed, even encouraged, to give a kid a good beating when called for. My dad was a strong advocate of this policy. After my dad settled down I made a pathetic attempt to see if the splintered bamboo pole would possibly fit back together…..no deal on that one. Now, as I was obligated to replace it, much of my paper route money for the next couple of weeks went to that cause, forcing me to mooch money for bait and other sundries off of my brother and friends, who learned to avoid me like the plague. And every trip after that incident my dad inspected the packing of the poles as if they were nuclear tipped missiles being placed in launch silos. The location we fished with Dad was always set in stone. 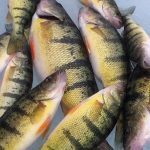 Although perch could be caught all up and down the Kenosha shoreline, most of the perch were caught in the main boat harbor downtown. Two piers, built many years ago, extend out several hundred feet into the lake to compose the large boat harbor. These are referred to as the north pier and the south pier. 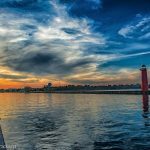 This is important, because in the perch fishing culture of Kenosha….you were either a north pier guy or a south pier guy. If a person from either one was to fish at the opposite pier they would come under derision from their peers; this was serious stuff. North pier guys and south pier guys didn’t mix; end of story. 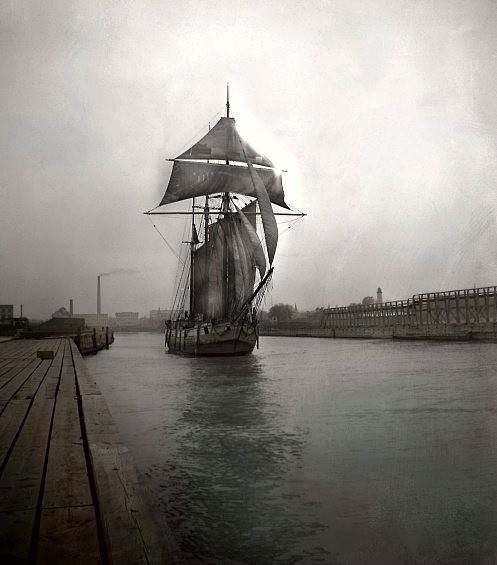 The Kenosha Harbor as it looks today. Photo by Cindi Fredericksen. By the sixties both piers were in considerable disrepair and caution walking on them was required. The middle sections were hollow and full of rip rap. These were favorite playgrounds and hiding places for young kids (and late night drunken indigents) that accompanied their elders for a couple hours of fishing. Each one had a cat walk that was occasionally travelled on, once again by playing youngsters or testosterone filled teens at night. The south pier had only one side facing water so the fishermen there were at a slight disadvantage. 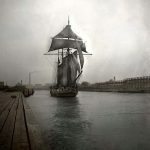 The north pier was surrounded by water on both sides, and although the side facing the harbor usually produced more fish, both sides would on occasion and on slow days be in use as fishermen moved from one side to the other in search of a bite. But in spite of the north pier advantage you couldn’t get a south pier guy over there on a bet. My dad, being an old north pier guy, was quite put out when one of his brothers defected to the south pier one year. You’d have thought he committed a crime against the family. My dad would talk to him after that, but the conversations were limited. The piers being adjacent to each other allowed fishermen on the south wall of the north pier and the fisherman on the south pier facing north to be well within eye and ear shot of one another. Occasionally derisive comments and taunting was tossed from side to side. When the fish came in, both sides anxiously eyed each other up hoping they wouldn’t be out fished by their cross pier rivals. The perch would enter the harbor in large schools and the fishermen toward the outer ends of the piers would start catching fish first. The guys farther down the pier could see many of the cane poles coming up one right after another with a “fish on”. This would be a busy time with much yelling and jabbering going on. The guys with two poles, and more than one hook on would sometimes get two “double headers” on at once. By one or one thirty even the most diehard fishermen knew it was time to throw in the towel. By now the swimmers were out on the pier running around, disrupting the tactics of our skilled anglers. Fishermen could only put up with so much nonsense. Once the screaming kids took over the remaining perchers usually vacated in short order. Once home the prized catch was shown off to anyone within eye or ear shot. The fish were taken out back to the picnic table along with the scaler, a knife, and some old newspaper. Few people filleted the perch back then, if you didn’t like picking through bones well maybe you were a “buncha old ladies”. After the catch was cleaned, the guts were usually dug into the family garden and the rest of the debris was wrapped in newspaper and discarded in the garbage can to ferment in the summer sun. The old newspapers kept the odor at bay for about 3 hours whereupon they reached a fine ambience which had the effect of catnip on all the local felines. Most nights they could be heard squabbling with each other in the middle of the night. Mornings involved a clean-up operation of the previous night’s feast. Although some people had chest freezers at the time, the perch were often kept in the “ice box” till Friday night for the family fish fry. Mothers would batter the perch and fry them in hot oil in the cast iron frying pan. French fries, home- made coleslaw, and rye bread were served along with the perch. Dad might have a beer or two and the kids would have a soda if they were lucky; milk if not, to wash the tasty feast down. “Dats great” would be the comment heard from dads all over town. Soon after, a retreat to the living room just in time for Gunsmoke, and another fine Friday night was had, along the shores of Lake Michigan.